I woke up at 4:00 o'clock one morning with this message on my head, "Step out in faith". As if someone was telling me, “Greg, you must step out in faith on this.” I got up immediately, went to the living room and declare my decision I am going to step out in faith no matter what the cost may be. I will act without fear but with confidence on God’s Word. For the last few months and weeks, my family had been struggling on something where there is no guarantee and security. This morning, I settled that question of uncertainty by moving ahead and stepping out on NOTHING. 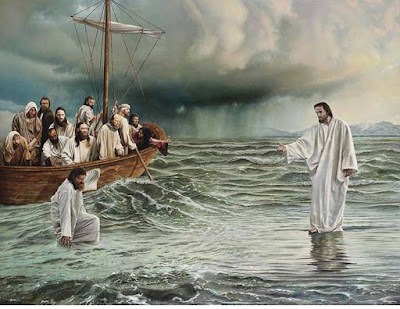 I agree with John Ortberg, “If you want to walk on Water, you've got to get out of the boat.” The message is clear, get out of the boat and step out on nothing. Doubt say, "What if I drown and die by getting out of the boat?" Can I trust the One who says’ “Come”? Getting out of the boat takes faith to the unknown result. To move from fear to faith is not normal. Doubt and fear must be replaced by trust and confidence! There is no way we can walk on water without first getting out of the boat. What lies ahead is full of uncertainty but I know whom I have believed He is my security. My confidence is not on my own faith itself. My confidence is on the object of my faith--JESUS. We can only move ahead and step on nothing without fear because we have confidence that God will be there. This means that either the water will turn to solid ground or God will catch me when there is nothing to land.